Many people are familiar with the sight of propeller-like rotating blades placed high up the pole of a high horizontal-axis wind turbine (HAWT). HAWTs are often grouped in wind farms and they provide large amounts of energy for local communities. However, HAWTs have a drawback, that is, they take large space and they need to be placed far apart from each other. If placed very close to each other, the wind velocity deficit and turbulence intensity caused by one HAWT can affect the output power of a neighboring HAWT. 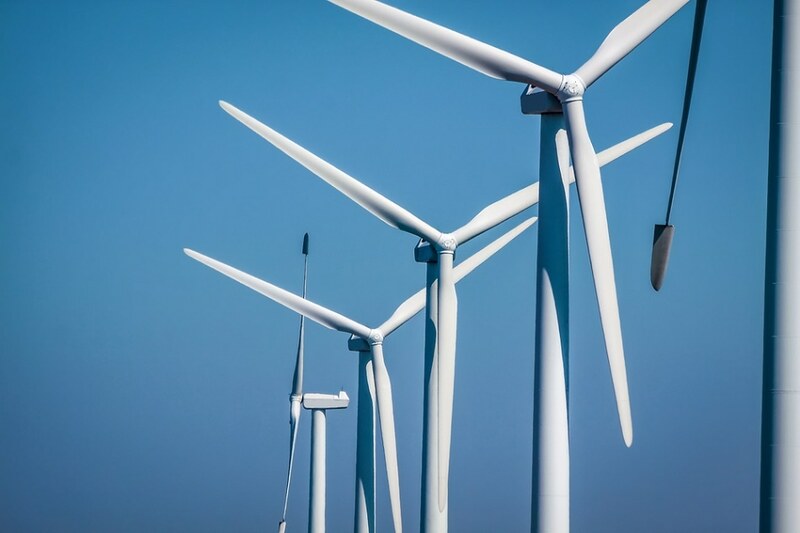 In order to tackle this, scientists are exploring vertical-axis wind turbines (VAWTs), which could be arranged in groups or spread out within HAWT arrays. A VAWT has a cylindrical shape, with the blades aligned parallel to each other and rotating around the pole on which the rotor is placed. These "egg-beater" VAWTs are much smaller compared to the "propeller" HAWTs, approximately 10 times shorter in height, and output only approximately 0.1% as much power per turbine. Anna Craig, a mechanical engineering doctoral candidate at Stanford University, and her collaborators recently examined modeling VAWT array arrangements. They report their findings this week in AIP Publishing’s Journal of Renewable and Sustainable Energy. Although an individual VAWT does not produce as much energy as a single HAWT, the wind flow synergies produced in a closely-spaced array of VAWTs can possibly produce up to 10 times more power per unit of land area compared to an array of widely-spaced HAWTs. For the vertical axis wind turbines, what you get, especially as you place them in close transverse proximity to each other, is that they can actually interact positively. Although it is still an active area of research, we think that the VAWTs can have blockage effects causing speedup around the turbines that helps downstream turbines. They can also have vertical wind mixing in the turbine's wake region, which assists in the wind velocity recovery. According to Craig, scientists agree that before deploying VAWTs at an energy sector scale, more research needs to be performed. However, Craig and her collaborators provided important insights into one crucial VAWT challenge: how to study, test and develop ideas for effective array arrangements. They performed this experiment in a lab because it is very expensive to conduct field testing, and at the same time, computer simulations are not refined enough or they are very computationally expensive. Right now the majority of numerical simulations are either fully two-dimensional or are three-dimensional, but use highly simplified, effectively two-dimensional models for the turbines. Neither approach can capture the vertical flows, which are critically important in the energy dynamics of a VAWT system. According to Craig and her collaborators, this lab experiment and similar studies provide significant possibilities for in-field arrangements and refining numerical simulations. The scientists performed their experiment in the large water flume at the Bob and Norma Street Environmental Fluid Mechanics Laboratory situated in the department of civil and environmental engineering at Stanford, where the water flow of the system effectively represented the wind flow. Craig arranged approximately 1,300 1-inch gears between plates that were reconfigurable during the experiment. The scientists mounted approximately 300 rotating cylinders on top of these gears in order to create a 10-foot-long array, with the rotating cylinders effectively representing VAWTs. They tested 10 different arrays with different configurations. The three variables I was looking at were spatial configuration, rotational configuration, and height configuration of the elements. I wanted to find out how the interactions between elements could set up larger scale flow patterns. The experiment shed light on the VAWTs' time-space averaged vertical flow, which is important for turbine arrangements. "What I saw is this net vertical flow from above the array, down into the array and out the sides of the array, which was somewhat unexpected." Craig said. "These net vertical and transverse flows eliminate horizontal homogeneity within the array and introduce a new mechanism by which the energy resource within an array can be replenished." Craig said that this experiment provides significant insights for future studies for numerical and in-field testing. The three-dimensionality of the flow through the array is critical to understanding the energy dynamics of the system. This paper really focuses on allowing us to design appropriate numerical and experimental studies. Craig is very positive about the VAWT technology and its potential uses, and she notes that in the future it could be spread out within HAWT arrays and could be brought to places that are not easily amenable to large HAWTs, such as cities and islands. She also said that VAWTs could potentially have lesser impact on environment compared to HAWTs. "We should consider numerical or even field experiments with larger numbers of VAWTs because the laboratory experiments have shown that the physical mechanisms are there for these larger arrays of turbines to work," Craig said.